Remember the marinara sauce made from the slow-roasted winter tomatoes that I told you about on Friday? Well, this is what I used my sauce for: Italian Turkey Meatballs. Super simple, figure friendly (it’s turkey after all) and most importantly, finger-licking-good. I guess you would use a fork to eat these and not your fingers, so the more appropriate phrase would be ‘fork-licking-good’. But that just doesn’t sound as good. Let’s just say they’re incredibly hearty and flavorful and downright delicious. Because being filled with herbs and cheese and simmered in a slow-roasted marinara sauce, really does make them fantastic. When the Buddy was about 2 years old, he ate meatballs like they were going out of style. I feel like I fed him meatballs at every single lunch for about a year. I wish I could say the meatballs I fed him were always homemade, but alas, I know he ate a ton of store bought, frozen meatballs. What can I say? I didn’t have a go-to meatball recipe back then. Now I do and wish I could tell the me from 3 years ago, ‘Hey, you! Yeah you, the one with the huge bags under her eyes. I know you’re tired, but it takes, like, no time at all to whip up a batch of turkey meatballs and they taste about 10x better than those ones you’re cooking up right now’. Because they really do. Not that I get down on myself about things like that because in the end, we are all here and surviving and I can chalk it up as something I’ve learned over the years as a mom and wife. Recipes that seem complicated, aren’t always. And those uncomplicated recipes can taste utterly amazing; like something you worked all day making. 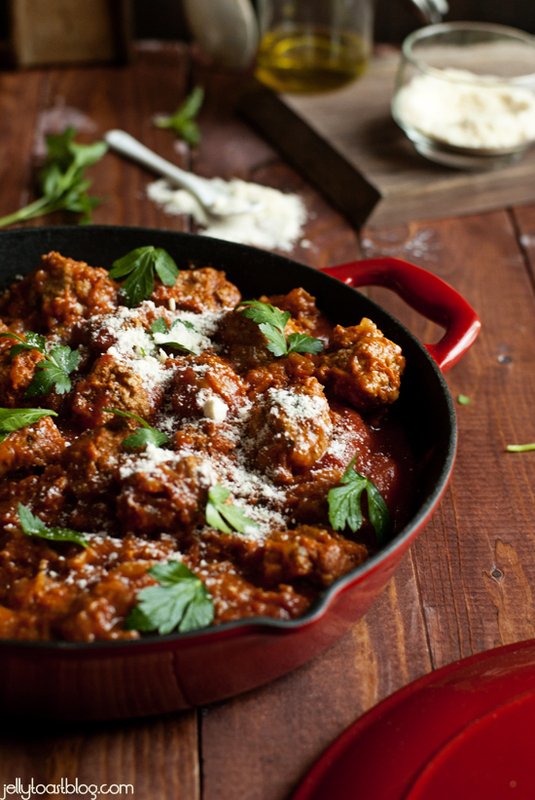 Spoiler alert: These meatballs are one of those recipes. In a large skillet or Dutch oven, add the marinara sauce and heat over medium low heat. Gently bring sauce to a simmer while you form the meatballs. In a large bowl, add remaining ingredients and mix gently with clean hands. Use a 1/4 measuring cup to scoop the turkey mixture and then divide mixture in half to form two meatballs per scoop. This method ensures an evenly sized batch of meatballs. Gently drop the rolled meatballs into the simmering sauce. Simmer for 20 minutes or until meatballs are cooked through. 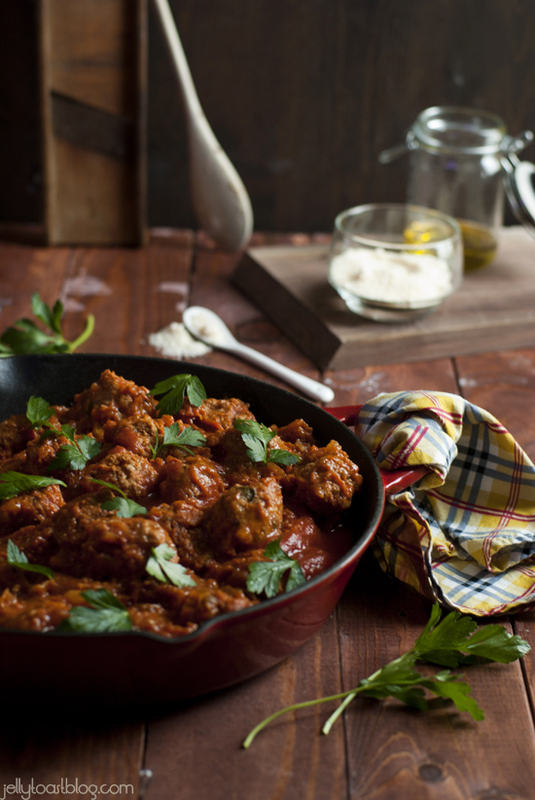 When meatballs are cooked, stir very gently with wooden spoon, taking care not to break up the meat balls. 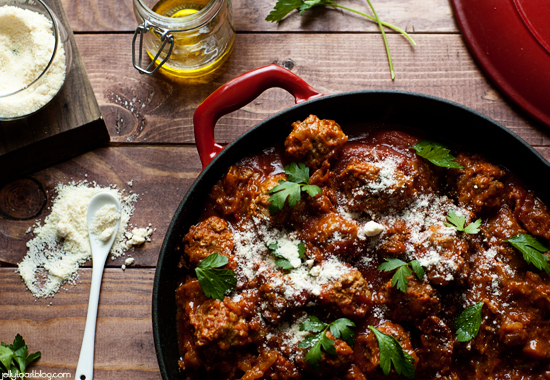 Serve over pasta, on a hoagie roll or just a big old bowl of meatballs. These are good. 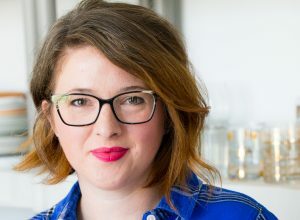 I make a similar meatball that I thought your readers might like to know about as it is intended as a low fat option. I use 1/2 cup bread crumbs, drop the egg and parm, and pour on some beef broth for moisture. Let the broth sit for a minute or so to soak into the breadcrumbs. Added bonus, the beef broth makes it taste more like ground beef meatballs, for those who think ground turkey is sub-optimal. I love the broth idea, Pete! lol, me too! Thanks, Monique!